When decorating our home, garden or our office for example, we need more ideas and new inspirations. An app that can help us find awesome ideas about interior designs is the one we’re sharing with you today. 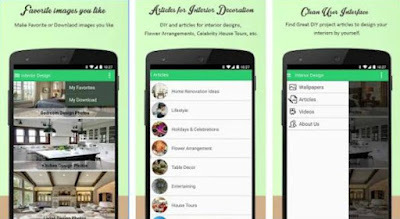 Interior Decorating Ideas is an Android app, developed by UMobile Apps. User friendly and with tons of helpful features, we highly recommend you get it if you are decorating your space. When you start the app, you will see how everything is excellently organized. You will be able to use it with an ease and find anything you need. Just open the main menu and choose between articles about interior designs or interior design videos. The articles are divided in multiple categories, such as Stylish House Tours, Flower Arrangements, Home Renovation Ideas, Holidays and Celebrations Inspiration, and many more. Browse through lots of images as set the one you like as your wallpaper, favorite images you like, save them in your device and share them to anyone. You can find cool DIY project articles that can help you design your interior by yourself. Use the Interior Decorating Ideas app when decorating your home, office, gym, garden, garage and exterior. Download it for free from Google Play and enjoy!